Etymology: According to the National Cattlemen’s Beef Association, this steak is marketed under various names, including Ambassador Steak, Club Steak, Hotel-Style Steak, Veiny Steak, Kansas City Steak and New York Strip Steak. 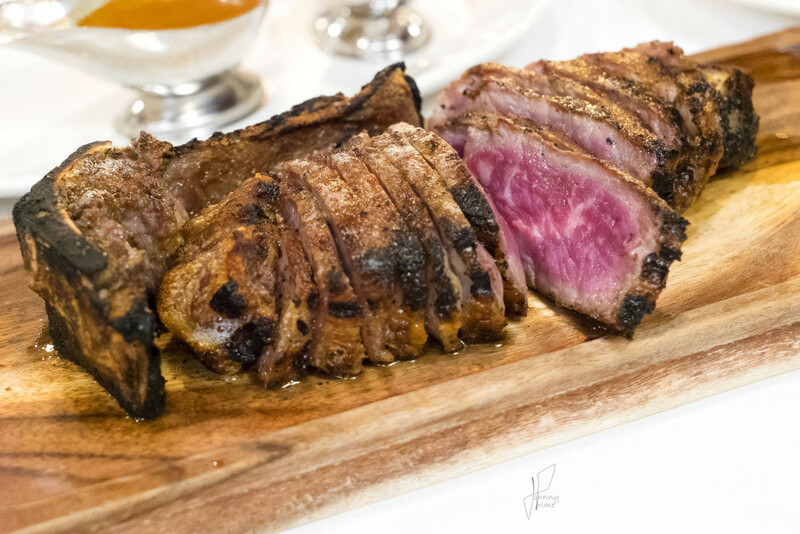 Delmonico’s offered Strip as a signature dish way back in the early 1800’s. Due to the cut’s association with NYC, the New York Strip Steak name was born. Anatomy: The Strip is cut from the other side of the tenderloin, across the vertebra on the T-bone or Porterhouse. 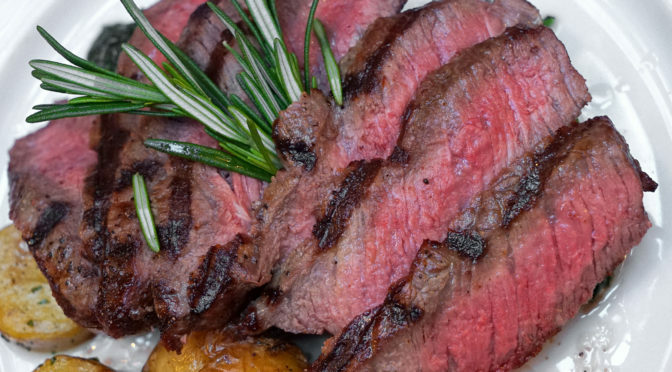 Also known as strip loin, the Strip Steak is cut from the short loin part of the animal, from a muscle that does little work, like the Filet Mignon. It is generally more tender than the similarly situated but more posterior-located sirloin section of the animal. While it is essentially the same kind of meat as sirloin, the muscles in the rear do a bit more work than the short loin, so can be a bit more tough. Preparation: For me, the Strip is best at medium rare, to preserve the tenderness and reduce any mealy or grainy textures that can develop from overcooking. It is always best to get a really great quality cut for this chop, something prime+, as all the intra-muscular fat, or marbling, will become soft and the muscle will tenderize all over. You will often see it marinated or rubbed with spices, to impart additional flavors, but grilling and broiling in the traditional style is fantastic as well, especially with butter and herbs. It can be served bone-in or boneless. Leaving the bone in will impart more flavor and help with the cooking process, since the bone conveys heat into the center of the meat while locking in juices. At home, marinade this puppy in something like soy sauce and garlic, and slap it on the BBQ for a few minutes on each side and you will have the perfect home-cooked steak. Flavor: This cut contains fat in levels that are somewhat in between the tenderloin (virtually none) and the Rib Eye (plenty of good, melty fat). Like the tenderloin, there is little variation throughout the cut, so the flavors and textures are more uniform for the Strip Steak, unlike the Rib Eye which has varying textures and flavors from one end of the cut to the other. The texture of a Strip can sometimes be a little bit grainy or mealy, and a bit more tight than a Filet Mignon or a Rib Eye – especially if it’s cooked too much.